2018 is shaping up to be an exciting year for T-Shirt print design. 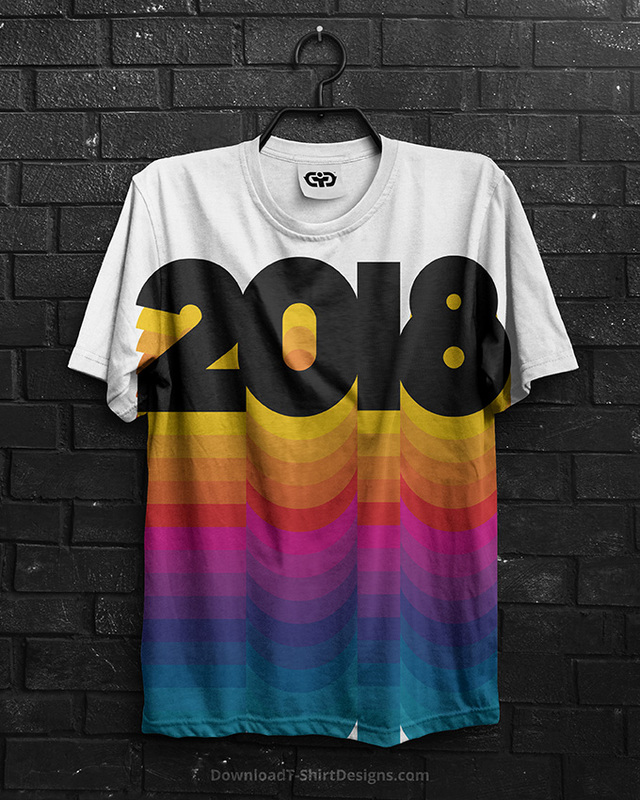 Check out our top 7 T-Shirt design trend predictions which will be making an impact in 2018, from statement making typography to cosmic exploration, and everything in-between! 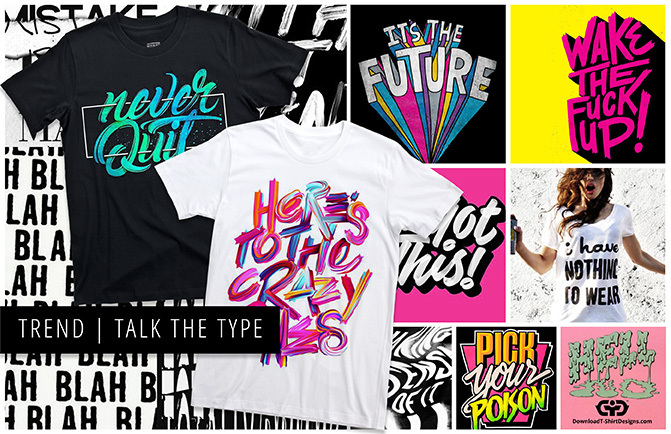 Creative slogan typography is among the leaders for T-Shirt design trends 2018. 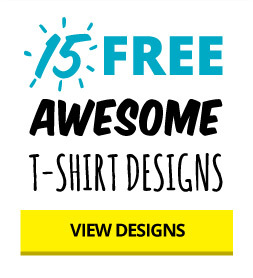 T-Shirt typography prints can help people send a message without having to utter a word. Typography slogan prints bring a feeling of youthful rebellion through slogans, fun phrases, ironic one-word musings & puns. 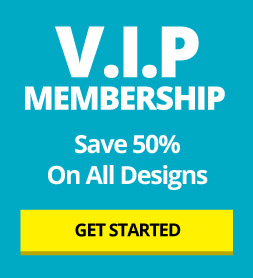 When it comes to design imagination is the key, typography can be combined with other techniques, used solely in the design, be monochromatic or boldly colorful. 2018 brings us even deeper into the holographic trend that was popular in 2017. 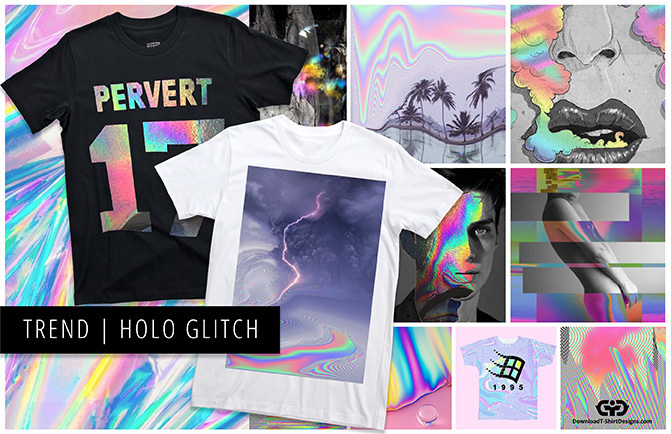 This trend continues to evolve into 2018 when combined with the ‘glitch’ effect. Color pigments are pulled, stretched, pixelated and distorted. Colors melt and blend into dynamic and futuristic compositions creating the effect of surreal lighting and digital distortion. These effects are combined with illustration, photographic images and typography. 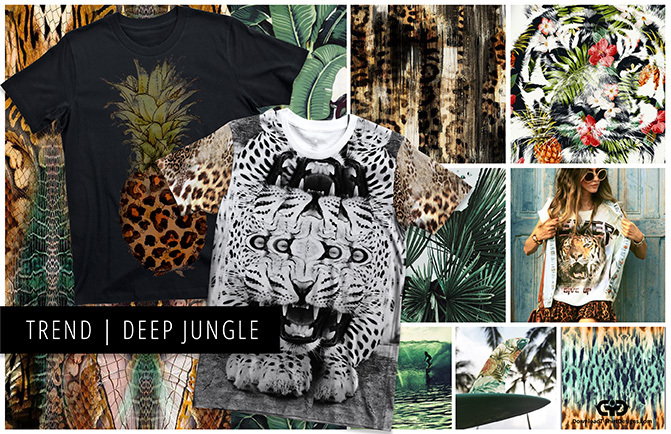 Dark and moody tropical jungle inspired T-Shirt prints feature heavily in 2018. This print trend is a darker take on traditional tropical prints giving them the versatility to be worn year round. Wild animal prints emerge in force to evoke the exotic feel and tropical blooms are given a moody overhaul, scattered across dark backgrounds interpreting dense jungle scenes. Digital and DIY collages emerge as a strong T-Shirt trend for 2018, collating a mis-match of imagery for a surreal playful aesthetic. Prints appear like puzzles with haphazard image pairing, incorporating a broad mixture of photographs, illustrations, patterns and textures. 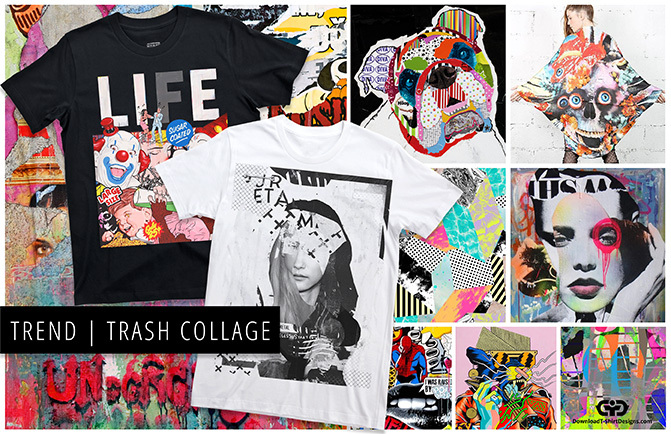 Cut and paste collage print techniques also include splashing, scratching, ripping off, breaking or any other form of ruining the aesthetics of a composition to give prints an edge. 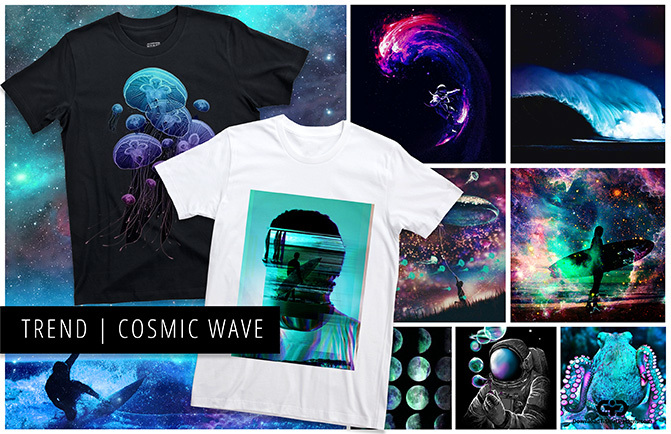 This T-Shirt print trend takes us on a journey down the darkest depths of the sea and up into the highest point in the sky and beyond into the unknowns of space. Combining astronomical explorations and submerged voyages to the deep oceans of our planet. Prints are reflective of space constellations, nebula, science fiction, ocean movements & deep sea creatures. 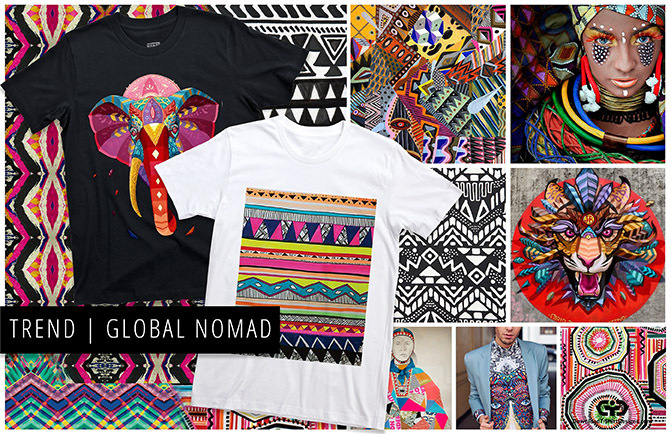 Embrace the nomadic spirit journey across continents with this hybrid eclectic T-Shirt print trend. African, Japanese and Middle Eastern influences converge, forming a cultural hypermarket of visual references. Traditional crafts and global references fuse and collide in an urban street sport look. Discard singular ethnicities, meld culture and tradition and create a truly global look that blurs borders in a bold and punchy color palette. The United States is the destination for this nostalgic look back at retro summer vacations. 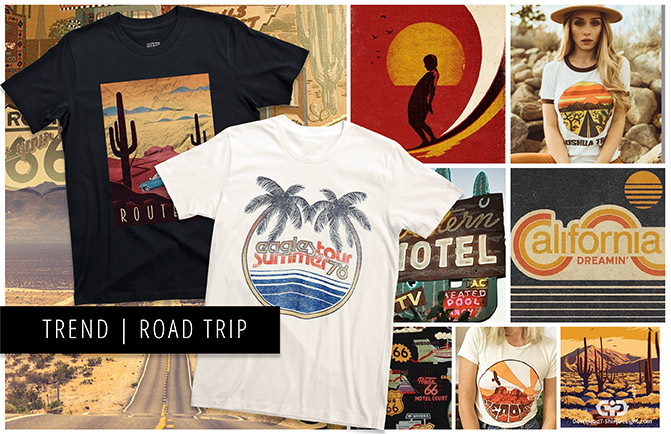 2018 T-Shirt designs are reflective of 1970’s and 80’s showcasing tropical elements, palm-shaded resorts and arid desert locations. Faded postcards inspire the vintage sepia tones and color palettes. Tourist T-Shirts and stickers inspire content and polaroid photos and magazine shoots inspire print panels and repeat patterns. Stay Tuned in 2018 as we release more trend information and inspiring new print designs that are ready for you to download and print on your t-Shirts and products.